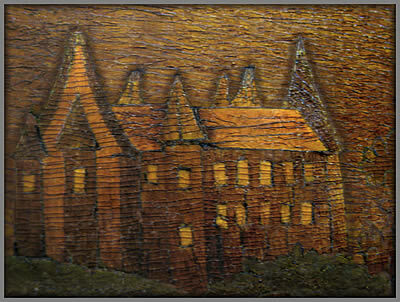 January's update features an unusual marquetry picture that may well be very old in marquetry terms, perhaps one to two hundred years possibly. From the look of things, we suspect it has probably been reframed at some time in its past. We think it may have originated as a very decorative panel in a very high quality piece of "chiffonier/credenza sideboard" style of furniture. The Georgian era saw the introduction of marquetry to furniture decoration, so we think this could be a good starting point from which to begin our considerations of just what this piece of marquetry actually is. 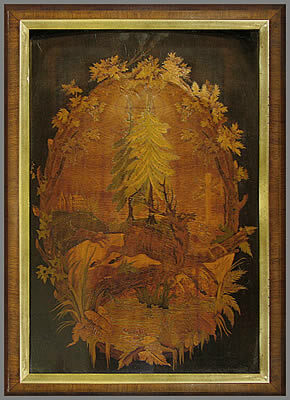 Our January 2011 update displays what is quite probably a rather old marquetry picture (or panel) of German origin. It is owned by Pat Summers and judging from the design and style of the marquetry used, it certaintly could be one of the oldest pieces we've ever included in our pages. "I have this very old picture which appears to be marquerty made from thousands of pieces of different woods. As far as I'm aware it is antique but I have no further ideas other than that. The back appears to be one sheet of wood and the nails used for holding the picture in place are very old flat nails of a type I've never seen before. The picture itself measures 15" x 21", which translates to roughly 38 x 53cms. An art dealer in Phoenix verified that this picture is indeed of very early German origin. Unfortunately I can't remember if he said it was early 18th.C. or early 1800's! However he really liked the picture and said he considered it was a beautiful piece. There is some kind of signature on the back of the picture. It looks almost like the person who signed it took a hot tool and then carved or burnt the signature in that way. I do not think the signature is in English somehow. I have tried my best, but I cannot make out all of the letters. It starts with a W and ends with "ing" I think. I can also make out the numbers 173. 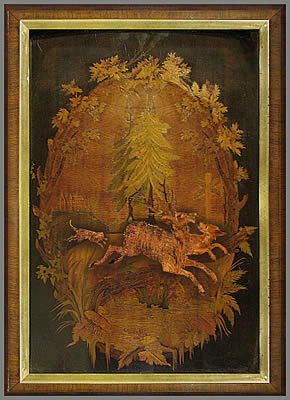 The main theme of the picture consists of a stag being chased by 3 dogs. There is also a castle to be seen in the left hand middle back ground, it is only about 1" in height. Some kind of direction post is there on the mid right, but I have no idea of its purpose. 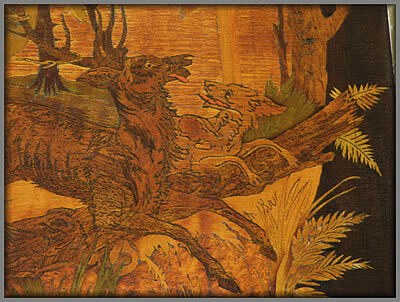 The remaining major marquetry motifs appear to consist of floret designs. The picture is now very dark, mostly browns and some dark greens; these are probably the results of the picture's age I would think. The picture and frame have a few small "nicks" on the front or face, but these could easily be fixed. Have you any idea of who may have possibly made it, or indeed any other information about it?" As we said in our introduction at the top of this page, it is quite possible that this wonderful picture started life as a central panel in an important piece of furniture. 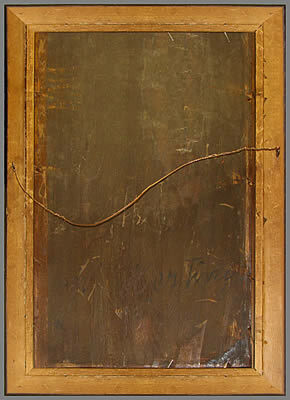 The rear of the picture would back up this hypothesis by the appearance of lighter edges around the picture's support board. The lighter edges would have come from the battens used for fixing the panel in place preventing any tarnishing of that area of the support board. If you can help Pat and ourselves with any information on what this panel actually is, please do write in tell us - we would love to know. Click the above button to return to page 31 of "Can You Help"